Waving flags, holding balloons and even praying, tens of thousands of Lebanese packed into a city square Wednesday to mark the second anniversary of Rafik Hariri's assassination. The government deployed hundreds of troops to deter violence, a day after two bombs (read more) killed three people. The country's long-running power struggle focused on Martyrs' Square, where a mass of government supporters gathered next to Hariri's grave and a much smaller number of opposition supporters camped in tents to demand the government's resignation. Backed by armored cars, soldiers erected a razor wire barrier to separate the two groups. Police conducted body searches as people arrived at the square. The government hoped a large turnout would strengthen its position against the Hezbollah-led opposition. To enable a big attendance, it declared Wednesday a national holiday, closing schools, universities, banks and public institutions. The opposition made clear it wanted the anniversary to pass without the violence that marred last month's demonstrations. In a a letter published on the front page of As-Safir newspaper Wednesday, Hezbollah leader Hassan Nasrallah praised Rafik Hariri, saying his killing by a massive truck bomb on Feb. 14, 2005, was a loss for the whole country. Hariri was Lebanon's most prominent politician and was credited with rebuilding the country from the destruction of the 1975-90 civil war. Prime Minister Fuad Saniora, a longtime confidant of Hariri, arrived early in Martyrs Square on Wednesday, and prayed at Hariri's grave, which lies at one side of the square. He was accompanied by his wife and several legislators. Hariri's sister, Bahiya, and son, Saad, both lawmakers, came separately to the grave and prayed. By late morning, the square was teeming with people waving the red-and-white national flag and political party flags. Many people held pictures of Hariri or balloons in the blue color of the Hariri faction in parliament, now led by his son, Saad. Some demonstrators took turns to pray in front of the grave. Others climbed the square's statue, which commemorates Lebanese martyrs of the Ottoman era. At exactly 12:55 p.m., the time of the fatal explosion, the crowd fell silent except for a muezzin making the Islamic call to prayer and the tolling of a church bell. Standing at the speaker's podium, Saad Hariri and his aunt Bahiya prayed. Speaker after speaker addressed the crowd from behind bullet-proof glass, calling for approval of a U.N.-created tribunal to try suspects in the Hariri assassination. The tribunal's ratification has been held up by political dispute. A respected Shiite cleric from southern Lebanon, Ali Amin, criticized the Shiite-backed opposition parties, Hezbollah and Amal, for failing to strike a deal with the government. The two parties withdrew from the Cabinet last year. "Our fate is through agreement and the mechanism is to return to the logic of the state and institutions," said Amin, without naming Hezbollah and Amal. Referring to the failure to ratify the tribunal, he said "it was strange" to oppose justice. Amin, who is the mufti of Tyre and Jabal Amel, is known to oppose Hezbollah and Amal. On the other side of the razor wire, opposition supporters were noticeably low key in the tent village they have been sleeping in for months. Mainly supporters of Hezbollah, the government opponents walked around to warm up under the sun. on commuter buses on a busy mountain highway northeast of Beirut stoked fears of turmoil. Lebanon has suffered a series of bombings during the past two years, mostly targeting anti-Syrian figures, but Tuesday's attacks were the first that seemed intended to cause maximum casualties among civilians of no political affiliation. "We will hunt down the criminals and confront them," Saniora vowed in a televised speech Tuesday evening. The U.N. Security Council condemned the bombing, urging all Lebanese parties to exercise restraint and stressing its support for the government. The pro-government majority in parliament said it held "the Syrian regime fully responsible for this despicable crime." 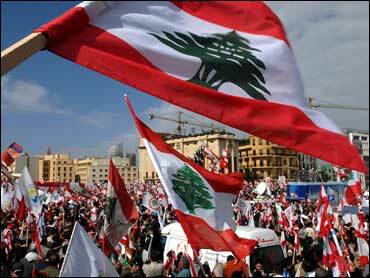 Syria routinely denies involvement in Lebanese unrest. Government supporters said the blasts were intended to scare people away from Wednesday's commemoration. They urged their supporters to show up in large numbers. The army deployed troops on highways to prevent friction between rival supporters as they approached the city center. Many roads were completely sealed off except for buses on designated routes which were expected to bring in government supporters from outlying areas. The potential for violence was demonstrated on Jan. 23 when a strike called by the opposition turned into clashes with government supporters. Two days later, an argument among students on a university campus led to rioting between supporters of the government and opposition. Eight people were killed in the violence. Hariri and 22 others were killed in a huge explosion that occurred as his motorcade was passing through central Beirut. He was buried a few blocks away from the site. Outrage over the assassination forced Syria to withdraw its troops from Lebanon two months later, ending a 29-year presence. A U.N. investigation into the assassination is proceeding, but Lebanon has been hit by a string of bombings in the past two years that many government supporters blame on Syria. Syria has denied any role in the attacks, including the Hariri assassination. None of the perpetrators have been caught from the series of bombings, which killed four anti-Syrian figures, wounded two others, and have occasionally struck public areas, killing three people. The blasts fueled tension in the power struggle where the opposition, led by the Syrian- and Iranian-backed Hezbollah, has vowed to bring down the government of Prime Minister Saniora. The opposition has demanded an enlargement of its representation in the coalition Cabinet to give it a veto on decision making. Saniora has rejected the opposition's demands, and the Hariri parliamentary faction and other pro-government groups have accused Hezbollah of doing Syria's bidding.